Who Should Be Treated with Immunotherapy? There has been much excitement in recent years around new drugs that exploit the power of the body’s immune system to fight cancer. In some patients, even with advanced cancers, these immunotherapy treatments have slowed or halted the disease after standard treatments no longer worked, with remissions lasting several years and patients experiencing less severe side effects. But, while researchers and clinical oncologists are hopeful that immunotherapies can make a major difference, these treatments currently benefit only a minority of patients and they don’t work in all forms of cancer – and predicting which patients and cancers will respond is still a challenge. With a few exceptions, immunotherapies aren’t yet prescribed as initial treatment for cancer. That said, it’s perfectly reasonable to ask your care team whether an immunotherapy drug could be part of your treatment plan. Several immunotherapy agents called checkpoint inhibitors have been approved for certain patients with melanoma, non-small cell lung cancer, renal cell carcinoma, Hodgkin lymphoma, head and neck squamous cell carcinoma, urothelial cancer, and colon cancer in which the tumor cells lack a DNA-repair protein. And one therapy, pembrolizumab (Keytruda), has been approved to treat any solid tumor with a specific biomarker – the first time a drug has been approved based on biomarker rather than tumor location. In addition to these approved uses, immunotherapy agents are being tested in hundreds of clinical trials worldwide – including dozens of trials at Dana-Farber’s Center for Immuno-Oncology. Immunotherapy adds a new dimension to cancer treatment’s traditional cornerstones of surgery, radiation, and chemotherapy. Rather than attack the cancer directly, immunotherapy agents mobilize the immune system’s defender T cells to seek out and kill tumor cells. Checkpoint inhibitors work by jamming a molecular “off” switch called PD-1 on T cells that cancer cells exploit to hide from immune detection and attack. When the off switch is disabled by a checkpoint blocker, T cells regain their power to recognize cancer cells and attack them. “There is an incredible amount of energy and enthusiasm going into scientific studies to find things that work to increase the success rate [of PD-1 checkpoint inhibitors], to extend it to other tumor types in a combination to do better,” says Gordon Freeman, PhD, of Dana-Farber. His groundbreaking discoveries about how cancer cells evade the immune response helped launch the development of immunotherapy drugs. 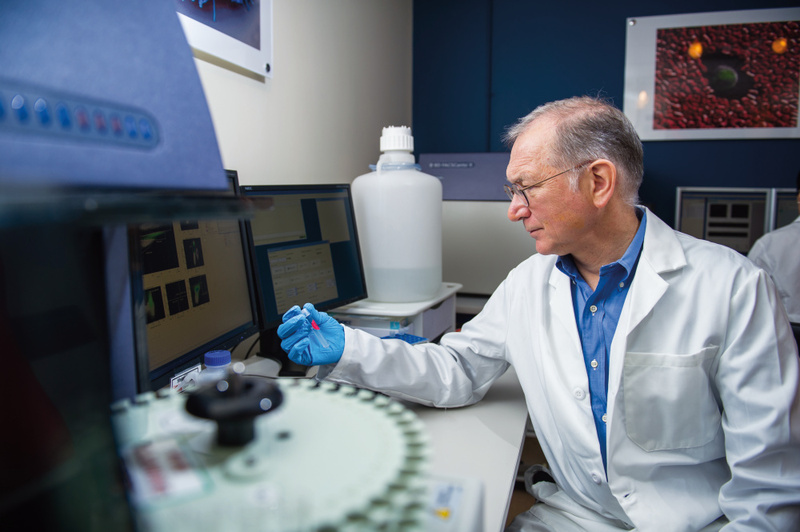 Scientists like Gordon Freeman study the role the immune system plays in stopping cancer. In some types of cancer, tests can measure the presence of biomarkers that predict the tumor’s response to checkpoint blockers. For example, in a clinical trial of patients with non-small cell lung cancer (NSCLC), patients whose tumor cells had high levels of the protein PD-L1 were more likely to respond to the immunotherapy drug Keytruda – and were more likely to be alive one year later than those receiving standard chemotherapy. This finding led to approval of the drug as initial treatment for patients with NSCLC and high levels of PD-L1. However, results of tests for biomarkers like PD-L1 don’t always correlate with how an individual patient responds, so the search continues for additional biomarkers and other ways to predict the effectiveness of immunotherapies. Researchers are also seeking ways to transform unresponsive tumors so they can provoke a stronger response from the immune system when treated with immunotherapy drugs. Your next story: What Are the Symptoms of Leukemia?